When somebody is given an epitaph of such utterly bonkers brilliance, it is unwise not to follow it up. Those words were not spoken with any great fondness, however. In fact, we are talking about a hard-bitten racer who managed to alienate most of his competitors, team mates and employers at some time or other. But in the long run he was often the right man at the right time. His name was Kenneth Henry Miles, known as simply Ken or, more often, The Hawk. None of these is a name that ranks alongside such British success stories of the ‘Fifties as Mike Hawthorn, Stirling Moss or Jack Sears in today’s world but in terms of his impact on the history of motor racing, his career stood tall alongside them. With his icebreaker nose and jutting jaw, Miles cut a distinctive figure in any paddock. He had been born in Sutton Coldfield, right in the heart of Britain’s industrial Midlands, just days before the end of World War 1. Like many young boys, he was enthralled by mechanical things and apprenticed with Wolseley, where he spent his pay on racing motorcycles. All this ended with the war. Miles’ mechanical expertise kept him out of the firing line and he ended up engineering tanks until he was demobilised in 1946. After the war, Miles joined the Vintage Sports Car Club and campaigned a lot of what were fairly cheap ‘old runabouts’ like Bugatti T35s and Alfa Romeo Monzas. Somewhat presciently, the first racing car that he built was a based on an old Frazer Nash into which he Inserted a Ford V8-60 engine and worked hard to turn it into a contender. The problem was that the war had robbed Miles of his best years. He was in his mid-thirties and a new generation of young British drivers, more than a decade younger than he was, had begun its presence felt. Miles did not really belong with them, nor was he a member of the ‘in-crowd’ at Goodwood. He might well have remained a committed clubman, were it not for a cast-iron belief in his own abilities. Instead of settling for a quiet life in Britain, Miles decided to head over to America. He found a blossoming motor sport community who wanted to campaign the European sports cars that they had fallen in love with – many of them while serving as GIs in the days after World War 2. Uprooting his wife Mollie and young son Peter, Miles moved to America and found work as the service manager for the Southern California MG distributor. While he was working on road cars, Miles built himself a ‘special’ – largely comprised of pre-war MG components. In 1953 he used it to win 14 straight victories in Sports Car Club of America-sanctioned races, building up funds to keep his family and build a second, more advanced ‘Special’ using his own bespoke racing chassis. The resulting machine was extremely low, a little curvy and in its brownish-green paint it looked like a plaice on wheels. Miles’ wiry figure loomed out of this odd-looking car, his dark green helmet canted over as he worked the wheel, and he called it the ‘Flying Shingle’. It might have looked like an ungainly homebuilt but Miles took the SCCA’s 1500cc class by storm throughout 1955, when competing against the new Porsche 356s and 550 spyders of wealthier drivers like Hollywood idol James Dean. The ‘Flying Shingle’ earned Miles some recognition back home, and he travelled to Le Mans for the fateful 1955 race, campaigning the lightweight MGA EX.182 and finishing in 12th place overall. In the USA, he continued to be a thorn in Porsche’s side and so the man charged with selling these mid-engined wonders in America – an Austrian émigré called ‘Johnny’ von Neumann –invited Miles to drive for him rather than against him in 1956. Miles duly won the first two races of the year and was a regular contender throughout the season, while Porsche relished not having to compete against his awkward little MG.
As well as driving, Miles got involved in race organisation. In fact, he assumed leadership of the Californian branch of the SCCA and managed every detail of race management, marshalling, ticketing and all else in between. He did so in an autocratic way that rubbed many people up the wrong way, but he also encouraged enthusiasts from all backgrounds to come and take part in motor sport. American motor sport in the 1950s was as clique-riddled and elitist as it was in Britain. Miles hated that, and did his level best to encourage the local kids to ‘run what they brung’, to learn their craft and then to take no snootiness from the posh collegiate racers on the East Coast – or even from Los Angeles, for that matter. Driving was fun and effective race management was important to him but Miles enjoyed engineering even more. In 1957 he mated the engine and transmission from a Porsche with an old Cooper chassis. These cars were known as ‘Poopers’ and became increasingly popular as more gleaming Porsche spyders got totalled in racing accidents and thereby more of their potent engines and transmissions became available to builders. Miles added some of his engineering savvy to the Pooper that he built for 1957 and not only dominated the 1500cc class but also scored regular podium finishes overall against cars with far more horsepower. Once again, Porsche took a dim view of this freelancing and being shown the way home by a homebuilt ‘special’ so Miles was quietly dropped and by the early ‘Sixties he was simply a hired gun driving an assortment of cars for whoever could pay him. He was undoubtedly still fast – in total Miles had racked up 46 career wins in domestic American sports car racing to the end of 1962 – but he was now getting well into his Forties and seemingly a spent force. It was at this time that Carroll Shelby came back from England with a little 2-seat sports car and a big idea. He invited Miles to join him in turning this idea into a car to beat the all-conquering Chevrolet Corvette. The result was the AC Cobra. Here’s a little something that pops up every so often – the racy demonstration of Sir Jack Brabham in his Brabham-Repco and Juan Manuel Fangio in his 1955 Mercedes-Benz W196. Both cars had been recently restored by their owners in Australia, and as a support to the 1978 Australian Grand Prix at Sundown they were to be reunited with their original drivers. 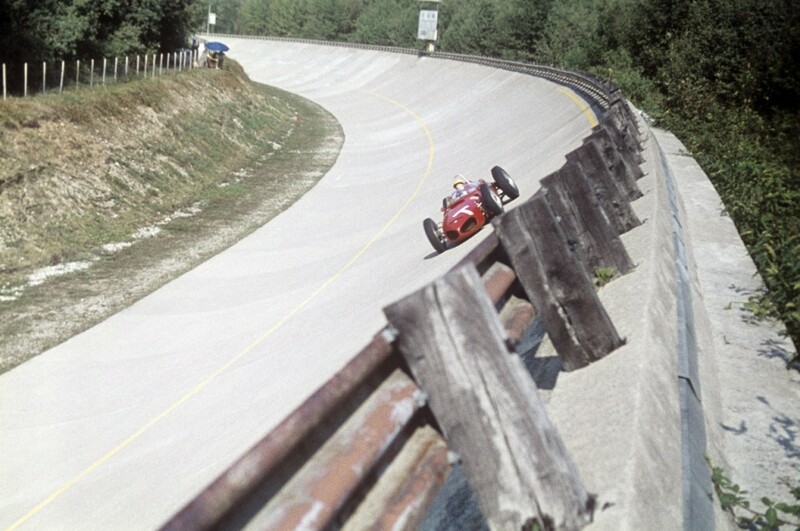 All the hype and Fangio’s own insistence was that this was not a demonstration by two champions but a race. Perhaps it was, but it’s worth remembering that, in their heydays, there was a full minute’s difference between the two cars over a lap of Spa-Francorchamps and 13 seconds at Monaco. Nevertheless, while Black Jack is the perfect gentleman and makes a show of it, it’s clear that Fangio is properly ‘on it’ for a recently-restored car that was worth a major sum of money even 40 years ago. And both men clearly wanted to be first past the chequered flag. Incidentally, the Australian Grand Prix was a Formula 5000 race, won by Graham McRae in his self-built Chevrolet-engined car in a highly attritional race that saw two drivers hospitalised. Here’s a rather lovely little bit of film for fans of the grassroots sports car racing promoted by the Sports Car Club of America in the 1950s – breeding ground for practically every American driver to make a splash on the international scene. This particular film shows the May race meeting of 1955 in Santa Barbara, California and it shows one of the locals getting involved in the action – Hollywood heart throb, James Dean. Santa Barbara’s circuit was a temporary affair at Goleta airport – a wartime airfield that became the regional airport and hosted both drag racing and circuit racing – the SCCA having events each May and September. The May race was a two-day affair on Memorial Day weekend but Dean had missed all of the action on Saturday because he was getting his hair done. Such was the studio system at the time that, with filming barely complete on his seminal Rebel Without a Cause, the newest hot-shot in Hollywood was already in for duty on his next feature, Giant. Presumably rather frustrated at the delay, Dean left as soon as he could without bothering to inform anyone involved in the film where he was heading. He charged up the Pacific Coast Highway to be reunited with the car that he would be racing the next day – his white Porsche 365 Speedster. Dean qualified only 18th but drove a strong race, climbing as high as fourth until the Porsche burnt a piston, putting him out of the weekend’s action. In the film shot at the event, the slight, bespectacled figure with a cigarette permanently drooping from his lips seems quite at ease – even posing quite happily with a couple of fans. What the weekend had shown Dean was that, as a racer, his Porsche 356 could no longer make the grade. He had to find something faster if his talents were going to be rewarded. Before then, however, there was another movie to made and when it was made clear to Warner Brothers and the production team on Giant how their star man was spending his weekends, a memo was sent banning him from competition for the duration of the shoot. With a difficult cast headed by Dean, Rock Hudson and Elizabeth Taylor, motor racing would have seemed like an uncomplicated oasis that was frustratingly being kept out of reach. Dean apparently spent his down-time on set pondering the virtues of cars like an Offenhauser-powered Lotus until he bit the bullet and ordered another Porsche – in this case a 550 Spyder. The cost was reportedly his old 356 in part-exchange plus $3,000 – which was a vast sum of money. But a new car to the specification with which Porsche was cleaning up in the smaller engine classes of sports car racing worldwide seemed like the obvious choice. In September, with filming on Giant complete, Dean brought his 550 – chassis 550 0055 – back to his garage and began learning how it performed on the roads near his home. This ended up needing one or two repairs – so that when the next available meeting came up at Salinas, Dean decided to try and get more miles in the car by driving it there instead of trailering it. Very few mass-produced motor cars have packed the same ‘wow factor’ as the original Ford Thunderbird. Its styling screamed of the jet age and mankind’s love of modernity. It was the ultimate chromium plated symbol of post-war consumerism. What it was not, however, was much of a performer. While its looks could not be faulted, the T-bird arrived just as Chevrolet showed that it had picked up a thing or two about European sports car dynamics and conjured the Corvette as a result. European sports cars were being imported to the States about as fast as the likes of Ferrari, Jaguar and Porsche could pump them out of their workshops and all of these confections left Ford’s ‘personal luxury car’ looking a bit green around the gills. Things got worse in 1956. In order to free up space in the boot – or ‘trunk’ as our trans-Atlantic cousins would have it – the spare wheel was moved up and out to stand vertically in a chintzy little case above the rear bumper. Just as Georges Boillot discovered in the 1914 Peugeot, this did nothing to assist the car’s dynamic properties. The Thunderbird went from being a fast-looking two-seater with a performance deficit to being a slow two-seater with an unwieldy rear end. While it still looked like a million dollars, it handled like loose change and sold in pitiful numbers. That’s why, after two years, the alpha male among Ford’s so-called ‘whiz kid’ management team, Robert Macnamara, gave orders to kill the two-seat model off and replace it with a four-seater for 1958. This meant that, for 1957 only, Ford’s engineers had the opportunity to show exactly what might have been and to send the classic Thunderbird off with some genuine sporting credentials. In 1957, Ford produced a total of 21,380 Thunderbirds. Of these, just 205 were delivered with what was known as the F-Code engine package. Soon to be whispered of in bars and at racetracks as the ‘F-bird’, Ford’s skunkworks delivered what was to be the ultimate Q-car of the 1950s. The F-Code engine was the largest of Ford’s small block V8s, the 312-cubic inch model, to which was added a McCulloch/Paxton supercharger, a hot cam, a Holley four-barrel carburetor, and unique cylinder heads, to keep the compression ratio at a reasonably sane 8.5:1. Either a three-speed manual or Ford-O-Matic transmission was available, running through a 3.56 rear axle – of which only 25 were factory fitted. None of this muscle was ever intended to go into a showroom model: it was Ford’s super-package for NASCAR and other motor sport applications. The F-code offered a conservative 300 bhp and a still more conservative 300 lb/ft of torque which could propel the Thunderbird to 60 mph in fewer than six seconds. It ensured that the Thunderbird turned into a velociraptor that could make mincemeat of the Corvette. All of this was a $340 factory option package on top of the ’57 Thunderbird’s $2,944 base price – cheap performance but putting the relatively hum-drum Ford into an exotic price bracket. That is why the volume of sales for the F-bird was so low – apparently endorsing Macnamara’s decision to kill off the two-seat car and replace it with something more family minded. Sure enough the 1958 Ford Thunderbird, with more seats, less power and less sass, broke all records in terms of sales. Ford’s beauty became less of a show pony and more of a success and that’s fine. But if you want to buy a Ford can stir your soul, some six decades after it appeared, you need to find one of those 205 F-birds. And around $200,000 to bring it home. Hot on the heels of noise about Alfa Romeo’s potential return to motor sport in the near future came word that Jaguar is teaming up with Williams to launch a full works Formula E effort. This is a brave move, given the scorn that was poured upon then-owner Ford when it had the temerity to build a front-wheel-drive car with a Jaguar badge on it a few years ago. Now the purr of a six-cylinder is to be replaced by the whine of an electric motor, no doubt prompting much gnashing of teeth among gentlemen of a certain vintage that the ‘leaper’ is set to be seen on a glorified milk float. Be that as it may, the automotive industry has some fairly major challenges ahead and these will only be solved by boldly going forth into new forms of powering its products. Electric vehicles are hideously inefficient, their production requires some horrendously toxic processes to take place and they are only ever likely to offer short-range inner-city transport solutions… but at least Jaguar is joining in the conversation. Sadly the most obvious course of action for a brand like Jaguar, such as developing a hydrogen fuel cell Le Mans car, is a bit too much of a stretch at a time when its profitability is taking a bit of a beating. Jaguar Land Rover is temporarily on the back foot thanks to some poor luck in the Far East and investing half a billion dollars in new production centres, which presumably makes a relatively low cost/high visibility programme like Formula E more attractive. But whatever the merits of Formula E, it is a positive thing that Jaguar is going to use motor sport to stake its place in the future of the industry. So to celebrate here is a gallery of loveliness to remind us all how much the big cat from Coventry has brought to the sport over the years. Silverstone’s fire tender is still a Jag. And Syd is still never far away. Following on from musings about Ian Fleming’s wild ride with Donald Healey in the 1932 International Alpine Trial, it has brought to mind the sale last summer of what is claimed to be the very Aston Martin that inspired Ian Fleming when writing the 007 novel Goldfinger – the mysterious ‘DBIII’. Could this have been the view intended for Bond? There never was a DBIII road car, and we can be fairly certain that Fleming never got his hands on a DB3s sports prototype, but this moniker was often informally given to owners of the DB2/4 series in the mid-Fifties. Last year, headlines were made when Coys announced that it had the Aston that had inspired Fleming consigned for its Blenheim Palace sale. The car in question was a DB 2/4 Mk I Vantage, chassis number LML-819, was delivered new on 4 July 1955 to the Honorable Sqdr. Ldr. Phillip Ingram Cunliffe-Lister, DSO. Just like Donald Healey before him, Cunliffe-Lister had been a wartime pilot – albeit in WW2, rather than WW1. He had flown Spitfires with Fighter Command and, later, joined 1409 Flight to gather meteorological information for Bomber Command and the USAAF in the twin-engined Mosquito. In July 1943 Cunliffe-Lister had been taken POW after he, along with Pilot Officer Pat Kernon, had taken off from RAF Oakington in Mosquito IX LR502 on a met flight over Holland. The aircraft ran out of fuel following a navigational error, but Cunliffe-Lister got the aircraft down and managed to evade capture for four days. Eventually the airmen were rounded up and sent to a transit camp for Air Force Prisoners of War before going to Stalag Luft 3 at Sagan, where he remained until his peacetime repatriation. It seems that the former pilot found civilian life something of a trial, leaving his wartime bride and children in 1947 and remarrying soon after while taking part in international rallies as a means to find the adrenaline rush he clearly craved. A decade later, Cunliffe-Lister took delivery of the latest source of excitement in his life: a gunmetal grey Aston Martin. While there is no record that Cunliffe-Lister and Fleming ever knew each other, both of their fathers had been close friends of Winston Churchill. Cunliffe-Lister’s father, Lord Swinton, was also head of MI5 during the Second World War while Fleming had been the bright young star of Royal Navy Intelligence. It has even been suggested the character of M may have been owed more than a little to Lord Swinton. So far so tenuous, but Cunliffe-Lister used to go on regular trips to see the Royal portrait painter Dennis Ramsay and his wife Rose at Hope Bay Studio, the house next to Fleming’s in St Margaret’s Bay near Deal, Kent. It is of note that Fleming used Hope Bay Studio as the inspiration for his character Hugo Drax’s property where he kept a rocket in the novel Moonraker. Doubtless he would therefore have taken note of the rather beautiful motor car outside, and his interest would have been still further piqued by its rather unique specification. This was no ordinary DB2/4: it had reinforced steel bumpers, concealed lockers, a heavy-duty anti-interference ignition system, driver’s seat connections for two-way radio and a Halda Speed Pilot… gadgets which bear a passing resemblance to those on Bond’s car in Goldfinger. Much of the real Aston Martin’s history is as mysterious as anything that Fleming ever conceived. Philip Cunliffe-Lister committed suicide in 1956, and the car changed hands – and colours – several times before it was seemingly parked in a shed and forgotten about for many years. A local engineer who had worked on Channel hovercraft eventually heard about the car and bought it as a father-and-son restoration project. As soon as they set to work on the car they realised that this was no ordinary Aston. Fortunately, their craftsmanship on the restoration coincided with much of the background on the Cunliffe-Lister family history in espionage coming to light at the end of the 50-year rule, which put a few jigsaw pieces in place. The valuation and sale did raise some interesting questions. This was an amateur restoration of a basket case that had no significant competition history, whose first owner had some unproven links to Ian Fleming and wartime espionage and parked outside a house he once wrote about. As far as provenance goes, this was all rather new territory. Surprisingly the car didn’t sell but afterwards it did elicit an offer of more than £275,000 from an interested party – a healthy 150 per cent premium compared to a similar car in standard trim. Whether or not it was sold remains a mystery – one that will doubtless be continued the next time LML-819 is consigned for auction. 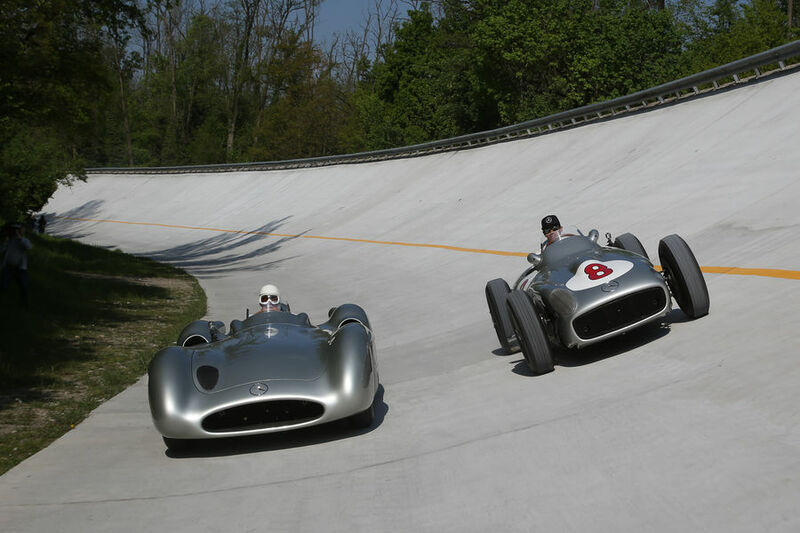 This week saw one of the motor manufacturers competing in F1 roll out some of its heritage – in this case Mercedes-Benz, which took two of its all-conquering W196s to Monza. In one car quite rightly Sir Stirling Moss was to be found. In the other was Lewis Hamilton. It is also a chance for Formula One drivers to endear themselves to fans by showing how much they value the sport’s heritage and appreciate their role in continuing the legacy. After all, if you’re one of the 18 men qualified by talent, marketability or financial backing to sit in one of the most exclusive clubs on Earth then it is entirely right and proper to celebrate such good fortune, is it not? 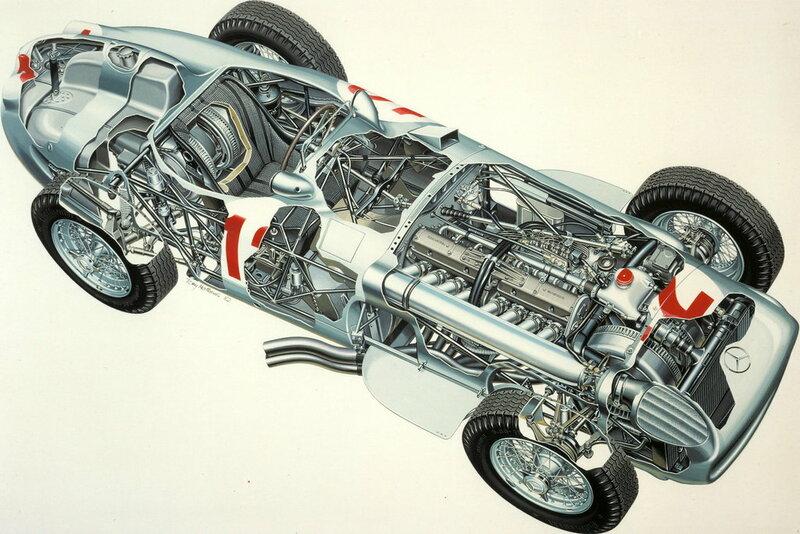 The problem is, of course, that the W196 was famously powered by a straight-eight engine with desmodronic valve gear. I know that there are question marks about Lewis’s technical feedback but spotting that this was not a V12 engine should have been a fairly straightforward task. I’m sure that one of the gentlemen of Mercedes’ fantastic technical team who tend these priceless cars would have explained it to him as well – although perhaps Lewis was preoccupied with his selfies at the time. Modern day racing drivers tend to do this sort of thing very well – even if driving old cars isn’t their cup of tea. Schumi was famously terrified when he drove one of Ferrari’s turbocharged cars from the 1980s and swore blind he would never again allow himself to be strapped into a machine that seemed intent on causing him actual bodily harm. He was not alone. David Coulthard found the pre-war Mercedes W125 rather too much for comfort and Mika Häkkinen really never liked driving the W196 because by comparison with his carbon fibre machine it lacked any sense of there being a functional set of brakes included in the design. And yet they did it with grace, good humour and the sense that they perhaps gained a little understanding of their privileged place in the world to be paid fortunes for driving cars that are a thousand times safer on circuits that are 60% run-off area and fenced in with soft barriers. Sentiments that do not come across from Hamilton’s exposure to the living legends of Moss, the W196 and the astonishing Monza banking. It was, as Lewis would no doubt say, an epic fail.